There are no comments for The Markswoman. Click here to post the first comment. 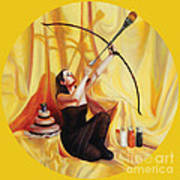 The Markswoman represents a balanced solar plexus chakra. A woman who is focusing and aiming a large paint brush. This painting represents the focus and direction of the will and personal creativity. She uses a bow and arrow to concentrate on the goal and we see her in the moment just before she releases the arrow. 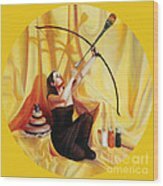 The guiding principals behind both the balance of the Manipura, or Solar Plexus Chakra are the element of fire and the force of combustion. The third chakra is located 2 inches above our belly buttons, it's color is yellow, it's energy is passion of the will and it's goal is to do. 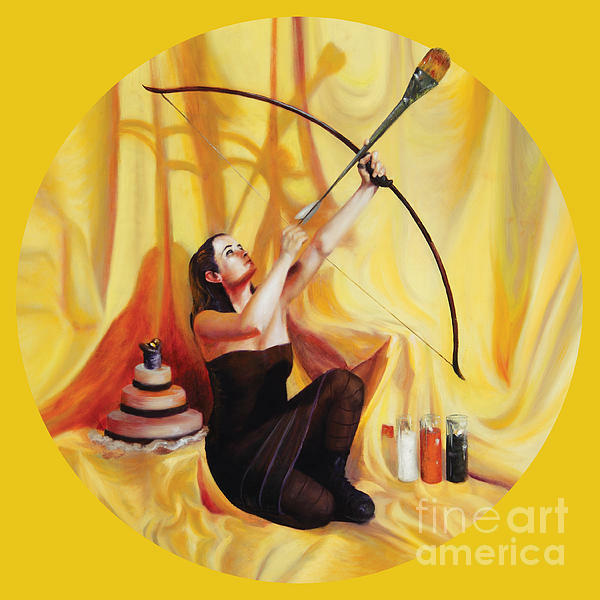 A woman kneels in warrior pose with bow and paint brush aimed, concentrating on artistic goals.